While there are plentiful data examining the fortunes of the top 1 percent at the national level, this report uses the latest available data to examine how the top 1 percent in each state have fared over 1917–2012, with an emphasis on trends over 1928–2012 (data for additional percentiles spanning 1917–2012 are available at go.epi.org/topincomes1917to2012). In so doing, this analysis finds that all 50 states have experienced widening income inequality in recent decades. After incomes at all levels declined as a result of the Great Recession, income growth has been lopsided since the recovery began in 2009, with the top 1 percent capturing an alarming share of economic growth. Data for individual states show that rising inequality is a pervasive trend: Between 2009 and 2012, in 39 states the top 1 percent captured between half and all income growth. The states in which all income growth between 2009 and 2012 accrued to the top 1 percent include Delaware, Florida, Missouri, South Carolina, North Carolina, Connecticut, Washington, Louisiana, California, Virginia, Pennsylvania, Idaho, Massachusetts, Colorado, New York, Rhode Island, and Nevada. The remaining states in which the top 1 percent captured half or more of income growth between 2009 and 2012 include Alabama (where 98.9 percent of all income growth was captured by the top 1 percent), Illinois (97.2 percent), Texas (86.8 percent), Arkansas (83.7 percent), Michigan (82.0 percent), New Jersey (80.5 percent), Maryland (80.5 percent), Nebraska (74.9 percent), Kansas (74.4 percent), Ohio (71.9 percent), Wisconsin (69.6 percent), Oklahoma (69.2 percent), Tennessee (68.5 percent), Iowa (65.0 percent), Georgia (63.6 percent), New Hampshire (59.5 percent), Arizona (59.0 percent), Maine (58.3 percent), Oregon (57.3 percent), Utah (56.6 percent), Minnesota (56.0 percent), and South Dakota (53.4 percent). Focusing on inequality in 2012, the most recent year for which state data are available, New York and Connecticut had the largest gaps between the average incomes of the top 1 percent and the average incomes of the bottom 99 percent. In both states the top 1 percent earned average incomes more than 48 times those of the bottom 99 percent. This reflects in part the relative concentration of the financial sector in and beyond the New York City metropolitan area. Lopsided income growth is also a long-term trend. Between 1979 and 2007, the top 1 percent took home well over half (53.9 percent) of the total increase in U.S. income. Over this period, the average income of the bottom 99 percent of U.S. taxpayers grew by 18.9 percent. Simultaneously, the average income of the top 1 percent grew over 10 times as much—by 200.5 percent. Piketty and Saez’s (2003) groundbreaking work, now more than a decade old, increased attention to the body of work compiled since the 1980s documenting rising inequality in the United States. Their work helped inspire the Occupy Wall Street movement of 2011 and continues to resonate in public protests. Growing public concern over rising inequality has also reinvigorated academic debates about whether inequality matters at all (Mankiw 2013) and about the role of finance and top executives in driving the growth of inequality (Bivens and Mishel 2013), and has spurred interest in the impact of rising top incomes on the number of Americans who actually experience a “rags to riches” story over their lifetime (Corak 2013). Before we begin our analysis of state data, it is useful to briefly summarize Piketty and Saez’s updated (2012) findings with respect to U.S. income inequality overall, focusing specifically on the share of income earned by the top 1 percent of taxpayers. They find the share of income captured by the top 1 percent climbed from 9.9 percent in 1979 to 23.5 percent in 2007.3 The share of income earned by the top 1 percent in 2007 on the eve of the Great Recession was just shy of 23.9 percent, the peak in the top 1 percent income share reached in 1928 (the year before the start of the Great Depression). Although the Great Recession reduced the incomes of the top 1 percent, their income growth once again outpaced the growth of incomes among the bottom 99 percent starting in 2010. By 2012, the most recent year for which national-level data are available, the top 1 percent earned 22.5 percent of all income in the United States. In the following sections we present data unique to this study that replicates Piketty and Saez’s method for each of the 50 states plus the District of Columbia. ŧ Only estimates of top incomes are currently available for Wyoming in 2012. Ŧ Overall income declined even as top 1% incomes grew over this period. In 39 states the top 1 percent captured between half and all income growth. In 16 states the incomes of the top 1 percent grew and the incomes of the bottom 99 percent fell, but top 1 percent incomes rose enough to generate an overall increase in average incomes (in other words, for 100 percent of taxpayers). Thus, in these states the top 1 percent captured more than 100 percent of the overall increase in income. These 16 states are Delaware, Florida, Missouri, South Carolina, North Carolina, Connecticut, Washington, Louisiana, California, Virginia, Pennsylvania, Idaho, Massachusetts, Colorado, New York, and Rhode Island. The remaining 22 states in which the top 1 percent captured half or more of income growth include Alabama (where 98.9 percent of all income growth was captured by the top 1 percent), Illinois (97.2 percent), Texas (86.8 percent), Arkansas (83.7 percent), Michigan (82.0 percent), New Jersey (80.5 percent), Maryland (80.5 percent), Nebraska (74.9 percent), Kansas (74.4 percent), Ohio (71.9 percent), Wisconsin (69.6 percent), Oklahoma (69.2 percent), Tennessee (68.5 percent), Iowa (65.0 percent), Georgia (63.6 percent), New Hampshire (59.5 percent), Arizona (59.0 percent), Maine (58.3 percent), Oregon (57.3 percent), Utah (56.6 percent), Minnesota (56.0 percent), and South Dakota (53.4 percent). Nevada was the only state where the growth in top 1 percent incomes (which grew 39.8 percent) was offset by a decline in bottom 99 percent incomes (which fell 16.0 percent). As such, overall incomes in the state fell 4.2 percent from 2009 to 2012. In nine states, both top 1 percent and bottom 99 percent incomes rose, and the top 1 percent captured between zero percent and half of all income growth. Those states are Indiana (where 49.4 percent of all income growth was captured by the top 1 percent), Mississippi (49.2 percent), Montana (48.9 percent), North Dakota (43.4 percent), Vermont (42.5 percent), New Mexico (40.3 percent), Kentucky (38.4 percent), Alaska (34.2 percent), and Hawaii (15.3 percent). In only one state, West Virginia, did the incomes of the top 1 percent decline as the average income of the bottom 99 percent grew. ŧ The average income of the bottom 99% could not be estimated in 2012 in Wyoming. According to state-level data, Connecticut and New York have the largest gaps between the top 1 percent and the bottom 99 percent. In both states the top 1 percent in 2012 earned on average over 48 times the income of the bottom 99 percent of taxpayers. This reflects in part the relative concentration of the financial sector in the greater New York City metropolitan area. Even in the 10 states with the smallest gaps between the top 1 percent and bottom 99 percent in 2012, the top 1 percent earned between about 14 and 19 times the income of the bottom 99 percent. Those states include Delaware (where the top 1 percent earned 18.5 times as much as the bottom 99 percent, on average), Kentucky (18.5), New Mexico (18.3), Mississippi (18.2), Vermont (18.1), Iowa (17.6), Maine (17.2), West Virginia (16.2), Alaska (15.3), and Hawaii (14.6). 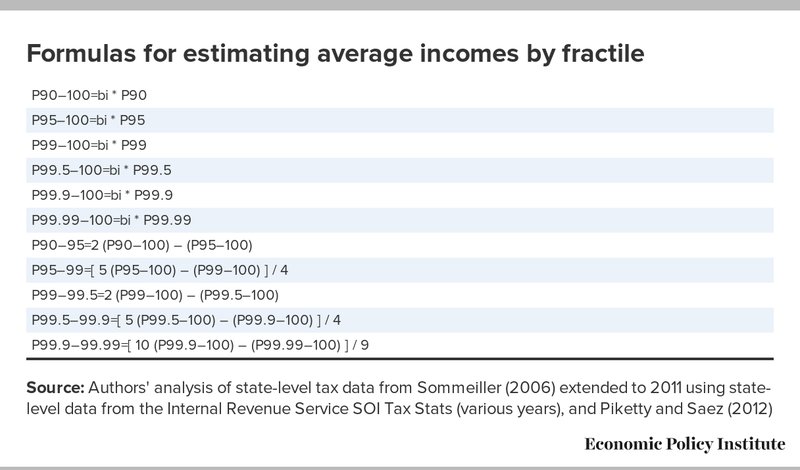 Reported in Table 3 are the threshold incomes required to be considered part of the top 1 percent by state. Table 3 also includes the threshold to be included in the 1 percent of the 1 percent (or the top 0.01 percent). Finally, the average income of the top 0.01 percent (the highest one out of 10,000 taxpayers) is ranked among the 50 states. Wyoming had the highest average income in 2012 for the top 0.01 percent, $368.8 million. Connecticut’s top 0.01 percent had an average income of $83.9 million, and New York’s, in third place, had an average income of $69.6 million. The lowest average incomes of the top 0.01 percent were $7.3 million in West Virginia, $10.5 million in Mississippi, and $11.2 million in Maine. It is important to note that lopsided income growth is not a recent trend. Its reemergence in the recovery is a continuation of a pattern that began three-and-a-half decades ago, as evidenced by the following examination of trends in income growth overall, among the top 1 percent, and among the bottom 99 percent from 1979 to 2007. The data in this section start in 1979 because it is both a business cycle peak and a widely acknowledged beginning point for a period of rising inequality in the United States. We end this analysis in 2007 as it is the most recent business cycle peak. This lopsided income growth means that income inequality has risen in recent decades. Figure A presents the share of all income (including capital gains income) held by the top 1 percent of taxpayers between 1917 and 2012 for the United States and by region. As Figure A makes clear, income inequality reached a peak in 1928 before declining rapidly in the 1930s and 1940s and then more gradually until the late 1970s. The 1940s to the late 1970s, while by no means a golden age (as evidenced, for example, by the perpetuation of gender, ethnic, and racial discrimination in the job market), was a period in which workers from the lowest-paid wage earner to the highest-paid CEO experienced similar growth in incomes. This was a period in which “a rising tide” really did lift all boats. This underscores that there is nothing inevitable about top incomes growing faster than other incomes, as has occurred since the late 1970s. The unequal income growth since the late 1970s has brought the top 1 percent income share in the United States to near its 1928 peak. Normally it’s during the economic expansion that follows a recession that workers make wage gains which hopefully leave them better off than before the recession started. But examining trends throughout economic recoveries in the postwar era demonstrates a startling pattern in which the top 1 percent is capturing a larger and larger fraction of the income growth. 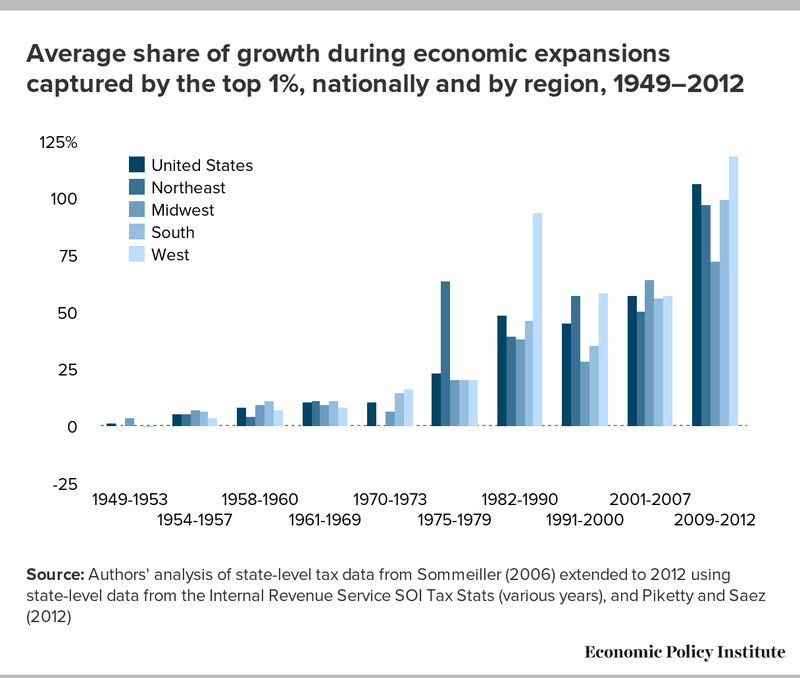 Between 1949 and 2012 there have been 10 economic expansions, with four occurring since 1979. Following Tcherneva (2014), Figure B presents the share of overall income growth captured by the top 1 percent during each of those expansions for the United States and by region. As Figure B makes clear, prior to 1979 the share of growth captured by the top 1 percent was much smaller than in each of the expansions since 1979. Before 1979, the top 1 percent’s share of income growth averaged between a low of 9.5 percent in the Midwest to a high of 13.9 percent in the Northeast. In the four economic expansions since 1979, the top 1 percent’s share of average growth ranged between 50.4 percent in the Midwest to 81.3 percent in the West. The 10 states where the top 1 percent captured the largest share of income growth in economic expansions since 1979 are Nevada (where 130.1 percent of all income growth was captured by the top 1 percent), Delaware (110.9 percent), Florida (110.8 percent), Washington (91.8 percent), Connecticut (90.1 percent), Missouri (88.5 percent), California (85.4 percent), Colorado (82.6 percent), South Carolina (77.6 percent), and North Carolina (73.9 percent). The 10 states where the top 1 percent captured the smallest share of income growth in economic expansions since 1979 are Montana (where 40.4 percent of all income growth was captured by the top 1 percent), Indiana (40.3 percent), Vermont (37.3 percent), Iowa (36.4 percent), Maine (36.1 percent), Hawaii (32.9 percent), Mississippi (29.0 percent), West Virginia (23.1 percent), North Dakota (23.0 percent), and New Mexico (17.8 percent). In all 50 states, the share of income growth captured by the top 1 percent is higher in the post-1979 recoveries than in the pre-1979 recoveries. Note: Certain expansions in the following states were excluded from the analysis because overall income growth was negative while top 1 percent incomes grew and bottom 99 percent incomes fell: Alaska (1982–1990), Colorado (1982–1990), Delaware (1975–1979), District of Columbia (1975–1979), Hawaii (1970–1973), Hawaii (1975–1979), Hawaii (1991–2000), Louisiana (1982–1990), Michigan (2001–2007), Montana (1982–1990), Nevada (2009–2012), New Mexico (1982–1990), Oklahoma (1982–1990), Texas (1982–1990), and Wyoming (1982–1990). The 1975–1979 economic expansion produced three additional outliers in New York, Maryland, and Montana, where there were slight gains in overall income but declines in income for the bottom 99 percent. As a result, the top 1 percent share of overall income growth was 1248 percent in New York, 301 percent in Maryland, and 301 percent in Montana. These figures raised the average share of growth captured by the top 1 percent during pre-1979 expansions from -6 percent to 203 percent in New York, from 7 percent to 56 percent in Maryland, and from 6 percent to 55 percent in Montana. We thus eliminated these three states from the analysis in Table 6. The expansion from 2009 to 2012 was dropped for Wyoming because we can’t currently reliably calculate the change in overall income in Wyoming. Data from the above states were all included in the calculation of trends by region. The rise in inequality experienced in the United States in the past three-and-a-half decades is not just a story of those in the financial sector in the greater New York City metropolitan area reaping outsized rewards from speculation in financial markets. While many of the highest-income taxpayers do live in states like New York and Connecticut, IRS data make clear that rising inequality and increases in top 1 percent incomes affect every state. Between 1979 and 2007, the top 1 percent of taxpayers in all states captured an increasing share of income. And from 2009 to 2012, in the wake of the Great Recession, top 1 percent incomes in most states once again grew faster than the incomes of the bottom 99 percent. The authors thank the staff at the Internal Revenue Service for their public service and assistance in collecting state-level tax data, as well as the staff at the University of Delaware library for their assistance in obtaining IRS documentation. The authors also wish to thank Emmanuel Saez for graciously providing details on the construction of the Piketty and Saez top-income time series and for providing guidance on adjustments to make when constructing a state-by-state time series. This work would also have not been possible without Thomas Piketty’s (2001) own careful work and notes on how he constructed his top-income time series. Thanks also to Stephen Herzenberg at the Keystone Research Center; Frédéric Lerais at the Institute for Research in Economic and Social Sciences; Lawrence Mishel, David Cooper, Lora Engdahl, Michael McCarthy, Elizabeth Rose, Eric Shansby, Dan Essrow, and Donté Donald at the Economic Policy Institute; Colin Gordon at the Iowa Center for Public Policy; and Doug Hall at the National Priorities Project for their helpful comments and support in the preparation of this report. 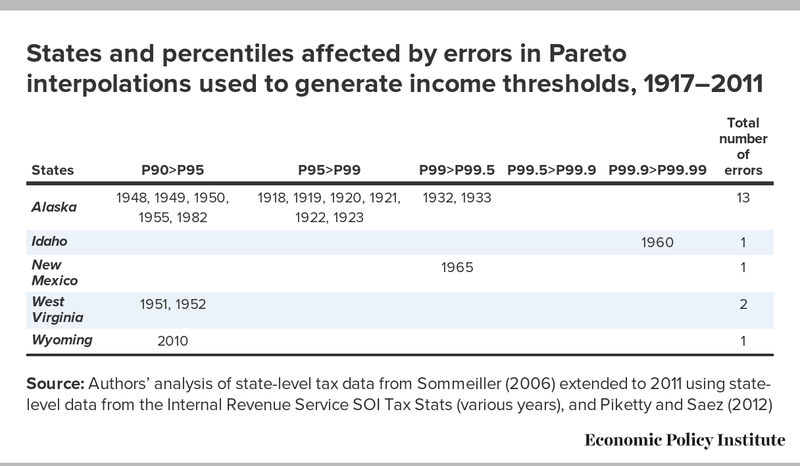 Knowing the amount of income and the number of taxpayers in each bracket, we can use the properties of a statistical distribution known as the Pareto distribution to extract estimates of incomes at specific points in the distribution of income, including the 90th, 95th, and 99th percentiles.9 With these threshold values we then calculate the average income of taxpayers with incomes that lie between these ranges, such as the average income of taxpayers with incomes greater than the 99th percentile (i.e., the average income of the top 1 percent). In the sections that follow we describe in more detail the assumptions we made in generating our top income estimates by state. 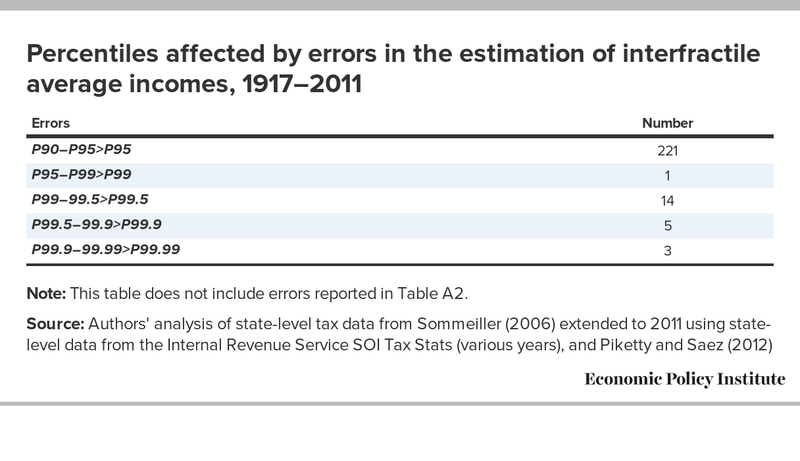 We will then review errors we observe in our interpolation of top incomes from 1917 to 2012 and compare our interpolation results to top income estimates obtained from the Pennsylvania Department of Revenue. Next we will briefly illustrate the calculations we used to interpolate the 90th, 95th, and 99th percentiles from the data presented in Table A1. Finally, the last section of the appendix will present our top income estimates for the United States as a whole, alongside the same estimates from Piketty and Saez (2012). In order to allocate Piketty and Saez’s national estimate of tax units to the states, we estimate each state’s share of the sum of married men, divorced and widowed men and women, and single men and women 20 years of age or over. From 1979 to 2012, tax unit series at the state level are estimated using data from the Current Population Survey (basic monthly microdata). From 1917 to 1978, the state total of tax units had to be proxied by the number of household units released by the Census Bureau, the only source of data available over this time period.12 For inter-decennial years, the number of household units is estimated by linear interpolation. We allocate Piketty and Saez’s total income to the states using personal income data from the Bureau of Economic Analysis (BEA). From 1929 to 2012 we calculate each state’s share of personal income after subtracting out personal current transfer receipts.13 These shares are then multiplied by Piketty and Saez’s national estimate of total income (including capital gains) to estimate total income by state over the period. Because BEA personal income data are not available prior to 1929, we inflate total income derived from the tax tables for each state in each year from 1917 to 1928 by the average of the ratio of total taxable income to total personal income (minus transfers) from the BEA from 1929 to 1939. The resulting levels are summed across the states and a new share is calculated and multiplied by Piketty and Saez’s national estimate of total income (including capital gains). After an estimate of top incomes was obtained via Pareto interpolation, Piketty and Saez adjusted average incomes upward to account for net income deductions (1917 to 1943) and adjusted gross income adjustments (1944–2012).16 We followed Piketty and Saez and made the same adjustments uniformly across the states. The IRS definition of income has varied over time. The IRS used the term “net income” until 1943, and “adjusted gross income” (AGI) from 1944 on. In the net income definition, the various deductions taken into account (donations to charity, mortgage interests paid, state and local taxes, etc.) were smaller over 1913–1943 than over 1944–2012. As a result, income estimates from 1913 to 1943 had to be adjusted upward. To a lesser extent, incomes between 1944 and 2012 also had to be adjusted upward, as the term “adjusted” in AGI refers to various income deductions (contributions to individual retirement accounts, moving expenses, self-employment pension plans, health savings accounts, etc.). As Piketty and Saez note (2004, 33, iii), AGI adjustments are small (about 1 percent of AGI, up to 4 percent in the mid-1980s), and their importance declines with income within the top decile. 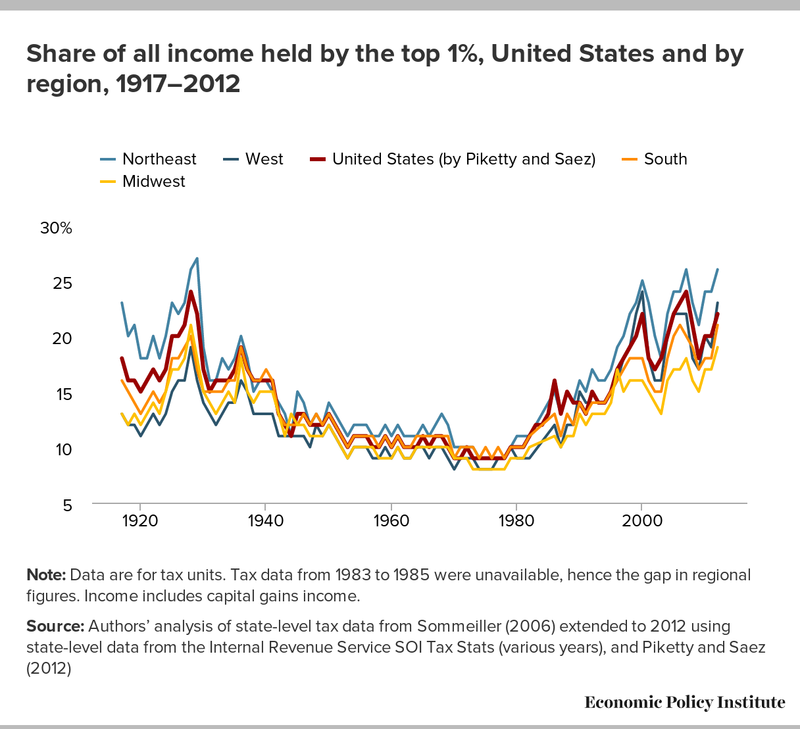 Instead, as a proxy we take each state’s deviation of top incomes from the U.S. average top income,17 and use this figure to adjust up or down the coefficients Piketty and Saez employ to correct for the exclusion of a portion of capital gains income from net income and AGI from 1934 to 1986. Data users should exercise some caution in analyzing the full data series (provided online at go.epi.org/topincomes1917to2012). We have identified 19 instances where our Pareto interpolation generated an income threshold that was higher than the next-higher income threshold. For example, in Wyoming in 2010 by Pareto interpolation we estimate the 90th percentile income to be $123,834, but also by Pareto interpolation we estimate the income at the 95th percentile as $119,168. Both estimates cannot be correct. The average incomes interpolated for groups between these thresholds will also be affected by this error. Table A2 presents the percentiles affected in each state by this error as well as the year in which the error occurred. Data users making comparisons over time should examine the entire time series for a state before drawing conclusions about time trends from a single point-to-point comparison. The methods discussed here to estimate top incomes from the data contained in Table A1 are not as precise as actually having a database of all individual tax returns from which to calculate average incomes for the highest-income taxpayers. 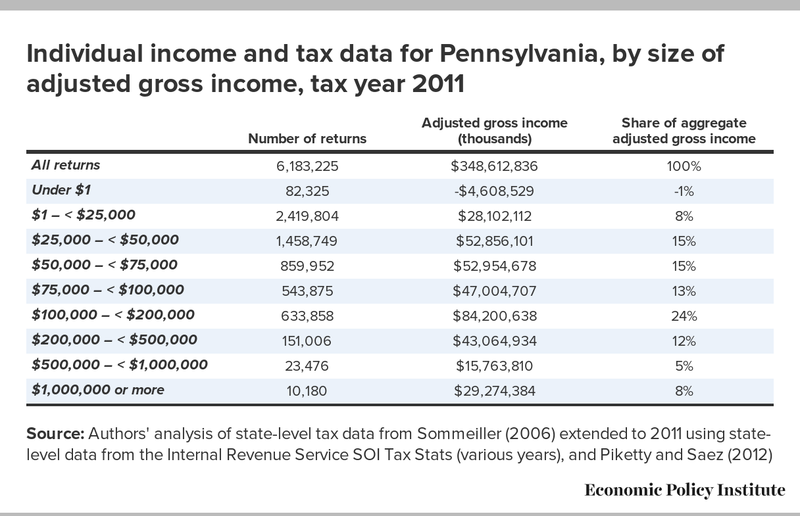 The Pennsylvania Department of Revenue has generated and published more-precise top-income figures for Pennsylvania taxpayers filing their state tax returns in recent years. This allows us to compare the actual income data with the results of estimates using our standard method (the standard method being our only option for generating estimates in the other 49 states and for Pennsylvania in earlier years). It turns out that our methods underestimate the actual rise in top incomes. Listed in Table A5 are the calculations we use to interpolate the 90th, 95th, and 99th percentile incomes for Pennsylvania.19 For brevity we present only the equations for calculating the average incomes by fractiles in Table A6. 1. Our estimate for the same period is 105.5 percent. 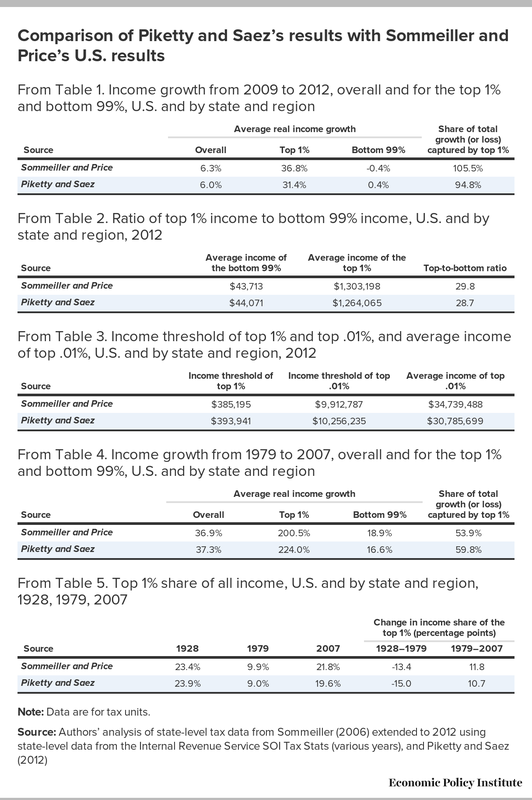 See Table A7 for a side-by-side comparison of our results and those of Piketty and Saez. 3. There are trivial differences between our estimates of top incomes and top income shares for the United States as a whole, and those calculated by Piketty and Saez. See Table A7 in the appendix for a comparison of results from the two sources. 4. Saez’s latest estimate, which incorporates data from 2012, is that the top 1 percent captured 95 percent of all income growth over 2009–2012. 5. In 2012 a discrepancy emerged between IRS income tax data and Bureau of Economic Analysis (BEA) data on personal income (minus transfers) in Wyoming. According to IRS data there was a surge in income concentrated among taxpayers with $1 million or more in income in 2012. In 2011 this group of taxpayers accounted for 16 percent of all taxable income in Wyoming; in 2012 this group accounted for 46 percent of all income in the state. As a result, Wyoming’s share of all taxable income in the United States rose from 0.22 percent to 0.32 percent. This rise in income was not captured by the BEA’s personal income measure, as Wyoming’s share of U.S. personal income (minus transfers) stayed at 0.22 percent in 2012. Because we allocate Piketty and Saez’s estimate of total income including capital gains to the states using BEA data on personal income (see the methodological appendix), the discrepancy between the tax data and BEA data artificially understates the growth of income in Wyoming as a whole. Consequently, we do not report overall income growth or income figures for the bottom 99 percent of Wyoming taxpayers. 6. 2012 estimates for the United States are based on Emmanuel Saez’s August 2013 Excel file, available online at http://elsa.berkeley.edu/~saez/TabFig2012prel.xls. There are trivial differences between our estimates of top incomes and top income shares for the United States as a whole, and those calculated by Piketty and Saez. See Table A7 in the appendix for a comparison of results from the two sources. 7. The top 1 percent share in Alaska rose slightly between 1928 and 1979. The top 1 percent share in Alaska between 1928 and 1979 averaged 4.6 percent, compared with 12.3 percent in the United States. 8. Certain expansions in the following states were excluded from the analysis because overall income growth was negative while top 1 percent incomes grew and bottom 99 percent incomes fell: Alaska (1982–1990), Colorado (1982–1990), Delaware (1975–1979), District of Columbia (1975–1979), Hawaii (1970–1973), Hawaii (1975–1979), Hawaii (1991–2000), Louisiana (1982–1990), Michigan (2001–2007), Montana (1982–1990), Nevada (2009–2012), New Mexico (1982–1990), Oklahoma (1982–1990), Texas (1982–1990), and Wyoming (1982–1990). The 1975–1979 economic expansion produced three additional outliers in New York, Maryland, and Montana, where there were slight gains in overall income but declines in income for the bottom 99 percent. As a result, the top 1 percent share of overall income growth was 1248 percent in New York, 301 percent in Maryland, and 301 percent in Montana. These figures raised the average share of growth captured by the top 1 percent during pre-1979 expansions from -6 percent to 203 percent in New York, from 7 percent to 56 percent in Maryland, and from 6 percent to 55 percent in Montana. We thus eliminated these three states from the analysis in Table 6. The expansion from 2009 to 2012 was dropped for Wyoming because we can’t currently reliably calculate the change in overall income in Wyoming. Data from the above states were all included in the calculation of trends by region. 9. Sorting all incomes from the least to the highest, the 90th percentile income is greater than 90 percent of all incomes and less than 10 percent. Similarly, the 99th percentile income is greater than 99 percent of all incomes and less than the top 1 percent. 10. See Piketty and Saez (2001, 36–37) for discussion of why they choose to use tax units rather than individuals. 11. 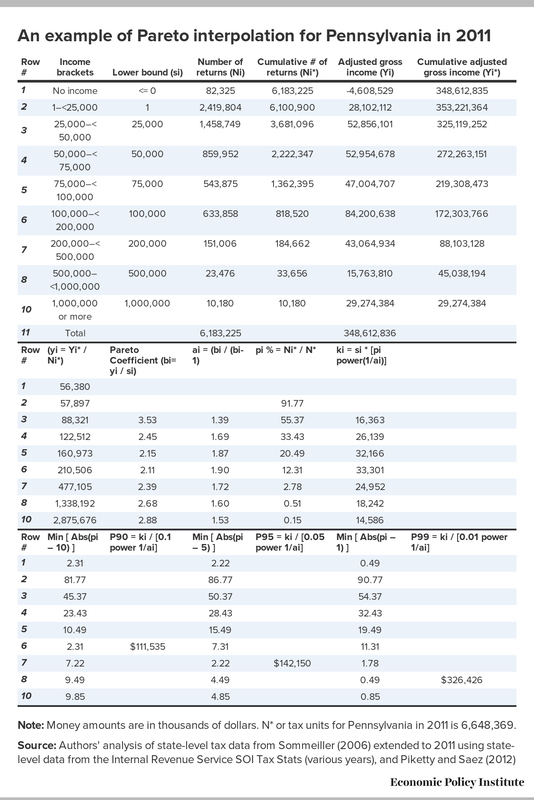 See Table A0, column six of http://elsa.berkeley.edu/~saez/TabFig2012prel.xls for total income (including capital gains), and see column one for tax units. 12. The decennial censuses do not provide a count of households in Alaska and Hawaii before 1960. We used the number of occupied dwelling units to estimate each state’s share of U.S. tax units from 1917 to 1959. Occupied dwelling units were available for both states from the 1950 Census of Housing (General Characteristics, Part 7) for both Alaska and Hawaii; the 1940 Census of Population for Alaska in 1940; and the 1940 Census of Housing (General Characteristics, Part 7) for Hawaii in 1940, 1930, and 1920. 13. The BEA does not publish personal income data for Alaska and Hawaii prior to 1950. We estimate Alaska’s and Hawaii’s shares of total income (including capital gains) from 1917 to 1949 based on their respective shares of U.S. total income (minus transfers) in 1950. 14. See Atkinson and Piketty (2007) for a discussion of Pareto interpolation. 15. We use the Pareto interpolation method to move from a varying number of income groups (as displayed in Table A1) to a fixed number of income fractiles, 17 in total: six top income thresholds (P90, P95, P99, P99.5, P99.9, and P99.99); six average income levels (P90–100, P95–100, P99–100, P99.5–100, P99.9–100, and P99.99–100); and five average income levels for intermediary fractiles (P90–P95, P95–P99, P99–99.5, P99.5–99.9, and P99.9–99.99) by state from 1917 to 2012. A detailed discussion of this technique can be found in Piketty (2001). 16. Emmanuel Saez graciously provided the precise adjustments that were made for net income deductions (1917–1943), adjusted gross income adjustments (1944–2012), and capital gains (1934–1986). 17. Our adjustment is: (state’s i top income – U.S. average top income) / U.S. average top income. For example, the average income of the highest-earning 0.01 percent of families in Delaware in 1939 was almost 10 times (9.4) the national average. Saez’s coefficient correcting the inconsistencies of capital gains over time is equal to 1.091 for that fractile. Inflating Saez’s coefficient yields 1.194 = 1.091 * (1 + 9.4 / 100). We apply this adjustment to all percentiles between 1934 and 1986. 18. Analysis of microdata from the American Community Survey suggests that linear interpolation, when possible, may be a more accurate way to estimate the 90th and 95th percentiles. One limitation of linear interpolation is that the 90th and 95th percentiles must fall somewhere below the uppermost income bracket of the tax tables. 19. 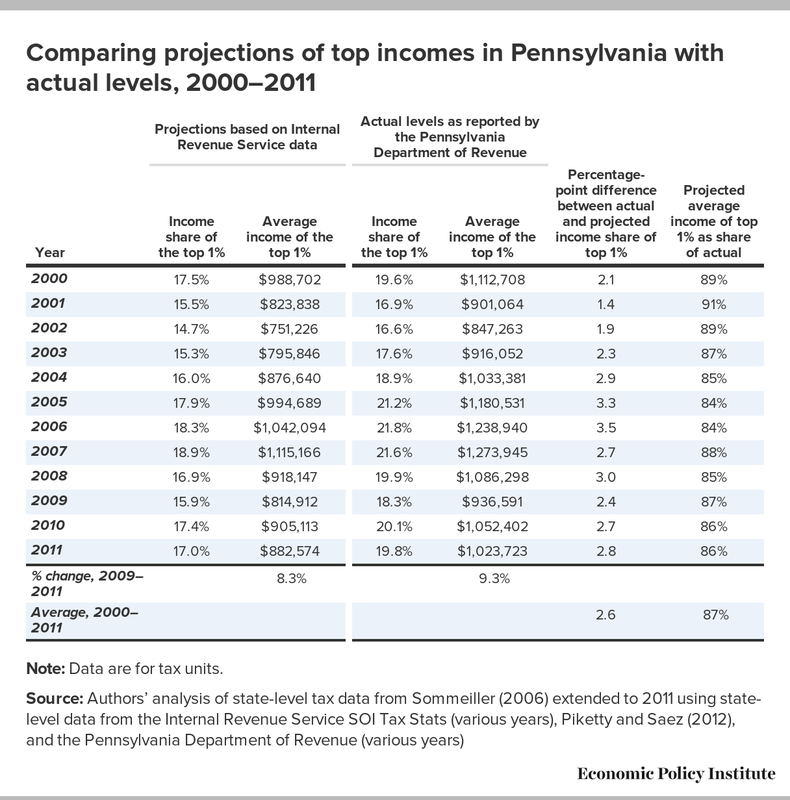 The differences between the figures for the P90, P95, and P99 reported in Table A7 and the final thresholds for Pennsylvania of $112,671 (P90), $143,601 (P95), and $329,763 (P99) reflect upward adjustments to incomes to account for downward adjustments to AGI for deductions such as IRAs, moving expenses, etc. Tcherneva, Pavlina R. 2014. “Reorienting Fiscal Policy: A Bottom-Up Approach.” Journal of Post Keynesian Economics, vol. 37, no. 1.